Intervention with venous stenting is experiencing a rapid growth due to advances in medical technology and increased awareness of the clinical relevance of the importance of deep venous obstruction. As this field begins to mature, stents specifically designed for the venous system are now available with more being tested in clinical trials. It is becoming clear that the anatomy and variety of venous obstruction is diverse, with the traditional May-Thurner syndrome comprising only a fraction of the cases of venous obstruction seen in clinical practice. Obstruction may occur anywhere in the femoral, common femoral, and iliac systems, as well as the inferior vena cava and may be due to a previous venous thrombosis or extrinsic causes. It is clear that this variety of etiology and extent of involvement will require diverse interventional strategies to achieve maximal patient benefit. In order to identify the anatomy and severity of venous obstruction better, a classification system analogous to those used to describe arterial obstruction is urgently required. A carefully constructed and validated system will facilitate the comparison of clinical strategies or venous devices for specific types of venous obstruction, yielding better outcomes for specific patient cohorts. An initial classification system for venous outflow obstruction is described with recommendations to improve this system, which requires prospective validation, in order to fill the void that currently exists. The vast majority of therapies used for diseases of the venous system are designed to treat the incompetence of the superficial and/or perforator veins in the lower extremity. The goal of these therapies is to eliminate abnormal reflux in these veins by removing or closing the offending veins to prevent blood from flowing in both directions in these channels. It is then rerouted into other superficial veins, or, more likely, the deep system to return to the heart. Until 10 to 15 years ago, only a few venous specialists addressed disease of the deep venous system using valve repair methods or valve transplants to improve venous function in the deep system. Unfortunately, in postthrombotic cases, valve repair was typically not possible and valve transplants often were not useful if significant obstruction persisted in the postthrombotic state. No corrective treatments were available for patients with severe postthrombotic symptoms due to venous outflow obstruction. Interventions designed to correct venous dysfunction in the superficial and perforator systems are often effective in eliminating symptoms for patients with chronic venous disease particularly in clinical, etiological, anatomical, and pathophysiological (CEAP) clinical classes C1 to C3. However, in classes C4 to C6, patients are more frequently affected by deep venous insufficiency or the combination of deep and superficial disease. In a study of C6 limbs, nearly 70% of patients were identified as having significant disease of the deep venous system.1 In the absence of effective therapies for deep venous insufficiency and related obstruction, it is clear that only a minority of patients with advanced venous disease are able to undergo corrective treatment to eliminate venous hypertension and return the venous system to a normal hemodynamic state. In their classic report, May and Thurner described the anatomy of the aortic bifurcation and inferior vena cava confluence and the resultant compression of the left iliac vein in 22% of the cadavers they studied.6 Subsequently, it has been recognized that compression of the iliocaval outflow tract can occur at multiple locations, including the hypogastric origin and the inguinal ligament, among others.7,8 Patients experience symptoms from anatomic compression alone (primary obstruction) and may also develop postthrombotic obstruction after iliac or caval deep vein thrombosis (secondary obstruction). Neglen and Raju’s publication on a large series of patients with iliocaval venous obstruction who were treated with percutaneous stenting demonstrated that the iliac veins and inferior vena cava could be successfully reopened, even in patients with veins that had been occluded for years.2 This pioneering study, combined with the availability of improved devices for recanalization and intervention, has led to a rapid increase in the number of procedures performed for the treatment of iliocaval venous obstruction. However, as this procedural area matures, fundamental questions concerning when and how to intervene on patients to maximize the benefits must be answered. Currently, there is no strong evidence available to determine when obstruction of the venous system is the source of limb symptoms and/or signs and should undergo intervention. Given that the normal anatomy at the iliac confluence often creates compression of the iliac veins,9 pathologic compression must be differentiated from compression that is unlikely to cause significant symptoms and/or signs. Physiologic testing with ultrasound and/or plethysmography have not been able to provide answers to this highly sensitive and specific question.10,11 Pressure gradients, which are helpful in arterial obstruction, are less reliable in the venous system. Fundamentally, it is difficult to obtain venous hemodynamics in the ambulatory state, and the measurement of venous parameters in the resting state may not be reflective of the situation during exercise. In a recent publication on deep venous diagnostic methods, Gagne et al studied patients before and after venous intervention with venography and intravascular ultrasound.12 They then correlated the percentage of the reduction area of the iliac venous lumen with symptom improvement after intervention as defined by the venous clinical severity score. A greater than 4-point reduction in the venous clinical severity score after intervention was defined as an indicator of clinically meaningful improvement. Measurements made by intravascular ultrasound were significantly better than venography as a predictor of clinical improvement. The best overall predictor of clinical improvement with intervention was a baseline intravascular ultrasound measurement of the area of stenosis that was >54% (Figure 1). However, in the subset of patients with a nonthrombotic iliac obstruction, intravascular ultrasound measurements of the diameter stenosis were more predictive than area measurements, with a value of >61% that was the most predictive of clinical improvement with venous stenting. While this information is useful and begins to provide some data to indicate which patients are more likely to benefit from an intervention, other critical pieces of information, such as the length of the diseased vein or the presence of multifocal areas of stenosis were not evaluated. These and other factors have been found to be important in assessing the need for intervention in the arterial system and are likely to have an impact on the venous system as well. Patients with iliocaval venous obstruction develop varying anatomical changes in the venous system. In some cases, obstruction involves only a short segment of the common iliac vein, where the contralateral iliac artery crosses over, leading to stenosis of the underlying vein (Figure 2). In other situations, the entire venous system from the common femoral vein through the vena cava is occluded (Figure 3). When considering methods of intervention to treat these problems, it is obvious that the diverse anatomy of venous obstruction may require different tools and strategies to optimize results. If we are to compare results between treatment strategies, we should be sure that we are comparing cases with similar levels of complexity, as is currently done in the evaluation of interventional treatments of arterial and aneurysmal disease. venous clinical severity score 6 months after stenting (n=64). collateralization to the contralateral iliac vein. 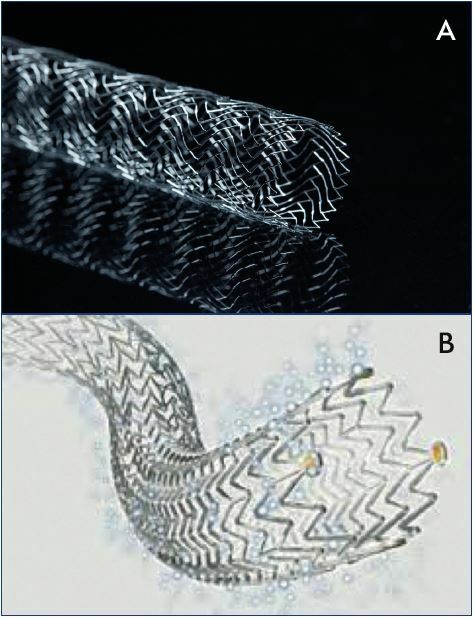 stent (Panel A) and Zilver Vena venous stent (Panel B). Table I. Current status of venous-specific stents. In the last decade, as interest in deep venous intervention has grown, multiple medical device manufacturers have developed stents designed specifically for the venous system (Figure 4). 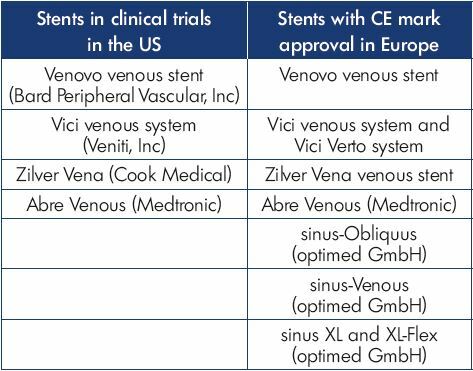 Several are CE Mark approved and in use in Europe, while ongoing clinical trials in the US are now nearing completion (Table I). There is great interest in the performance of these venous stents to determine how they will compare with the Wallstent. However, when considering the design of any stent, there are significant engineering tradeoffs that must be considered, such that it is unlikely that any one design will be the best solution for all types of venous disease. There are numerous different stents designed to treat diseases of the arterial system, including self-expanding or balloon-expandable, bare-metal or covered, stainless steel, nitinol alloy, cobalt alloy, and others. The development of biodegradable materials is ongoing, and all of the above may be combined with drug-eluting strategies to improve performance. At the core of this variety in stent development is the understanding that different clinical situations require different device strategies to obtain the best results. For instance, treating an ostial renal artery lesion would require a completely different device strategy than a midpopliteal artery lesion. Fortunately, the arterial device industry has matured to provide specific solutions for the diverse variety of pathology encountered. In the treatment of venous obstructive disease, the situation is similar. Given the variability of the anatomic distribution and extent of the disease, one venous stent design is not likely to suit all situations encountered by the venous interventionalist. 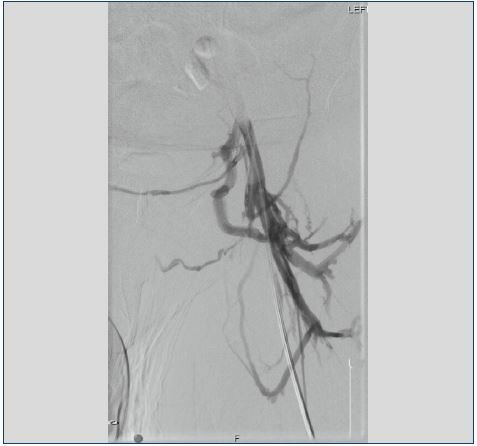 A stent that performs well in a nonthrombotic patient with localized compression at the iliac vein confluence may not be ideal for a postthrombotic patient with chronic total occlusion of the external and common iliac veins. It is important that we compare outcomes with devices in specific anatomic situations to determine which venous devices will perform best for individual patients with iliocaval venous obstruction. A detailed system for the description of the anatomic obstruction of the deep venous system that defines the variety of disease types encountered in the care of these patients is essential to facilitate these comparisons. Likewise, detailed information concerning the hemodynamic impact of venous obstruction will improve our ability to determine which patients would benefit from intervention and the best methods of intervention. However, separating patients based simply on whether or not they have a history of prior deep vein thrombosis is only a start and is prone to inaccuracies. There is great variety in the extent of deep vein thrombosis burden, with some patients having a focal involvement in the affected limb and others having an extensive involvement. In addition, while some postthrombotic patients are left with significant obstruction of vessels throughout the affected limb, others have extensive thrombus lysis leaving minimal residual obstruction. A classification system based on anatomic findings prior to the intervention, similar to the TASC arterial system would improve our ability to predict results from intervention and compare technical and device aspects of intervention to define best practices and improve patient outcomes. A group of venous interventionalists created an initial classification system, like the TASC criteria for iliac arterial disease, that included four types of iliocaval venous obstruction based on the extent of venous involvement and the severity of obstruction (Table II).16 In this system, a patient with stenosis of a single venous segment in the outflow tract (common femoral vein, external iliac vein, common iliac vein, or inferior vena cava) was defined as type I. Those with multiple segments identified with stenosis (defined as >50% narrowing) were assigned to type II. A single segment with complete occlusion was defined as type III, whereas multiple segments of occlusion were categorized as type IV. Table II. 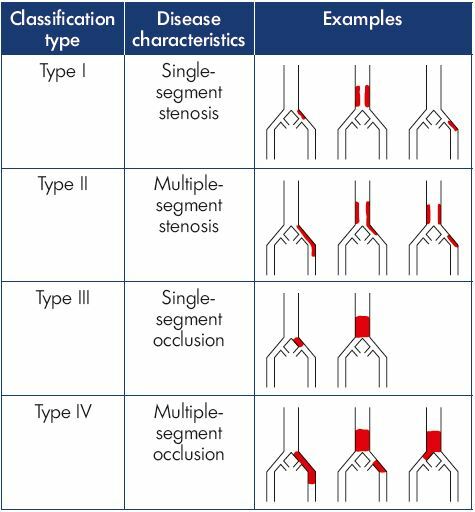 Iliocaval venous obstruction classification system. This initial classification system was tested in a retrospective study of patients with iliocaval venous obstruction undergoing an intervention at two vascular centers.16 While it is likely that intravascular ultrasound is the most accurate way to perform venous classification as long as imaging of the venous system from the femoral vein to the suprarenal inferior vena cava was performed, a variety of diagnostic methods were used in this initial effort. Computed tomography venography and magnetic resonance venography are acceptable tests, if the venous contrast is well timed to image the system and identify areas of significant obstruction.9 This assessment allows classification to be performed before intervention to counsel patients better and choose an interventional strategy. A total of 120 patients were identified as having clinically significant iliocaval venous obstruction and an intervention was attempted, of which 42% were in the type I group, and the remainder were evenly distributed between types II, III, and IV. Technical success in reestablishing unobstructed venous outflow was achieved more often in types I and II than in types III and IV (P=0.003) (Table III). Iliocaval patency was measured at 6 months postintervention and showed significantly better results in types I and II than in types III and IV (P=0.02) (Table III). The classification system seemed to provide additional predictive information regarding the classification of nonthrombotic or postthrombotic disease, as patients with postthrombotic disease who were type I had better outcomes than type IV postthrombotic cases. 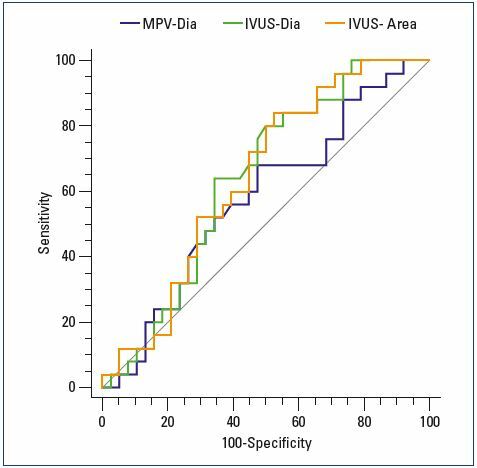 This initial report supports the belief that a well-designed and validated classification system for iliocaval venous obstruction cases could appropriately identify the expected risk and outcomes for the spectrum of disease encountered in this growing area of intervention. Just as the TASC system has done for arterial interventions, varying treatment strategies can be compared for specific types of disease and the outcomes that follow, ensuring that similar types and severities of disease are involved in the comparison. Inevitably, the venous space will evolve as the arterial space did before it and, hopefully, have not one, but multiple venous stents of varying design that may be used when their design characteristics yield the best results. Other devices specific to the venous system would also benefit from the use of an iliocaval venous obstruction classification system to facilitate clinical studies. This novel classification system is likely to be too simple to adequately capture all of the key predictors of outcomes associated with intervention for iliocaval venous obstruction. The presence of inferior vena cava filters associated with caval occlusion, as well as the presence of bilateral disease and a history of prior stenting may all have a significant bearing on outcomes. Previous reports have also suggested that inflow into the iliac venous segments, hypercoagulability, and compliance with anticoagulation treatment regimens are also important predictors of outcome after venous stenting.15,17 A well-developed classification system should capture all of the anatomical factors affecting outcomes to provide the best predictive information to guide treatment and device development. Significant challenges exist in defining and validating a classification system for the venous system. The absence of widespread use of validated physiological tests for the venous system that characterize venous hemodynamics in patients with obstruction leads to challenges in outcome reporting in this area. Symptom improvement is often subjective and may depend, in some cases, on other conditions that coexist with chronic venous disease. Likewise, it is challenging to determine the severity of inflow obstruction in the venous system. While duplex ultrasound and computed tomography or magnetic resonance imaging can provide an anatomical picture of where the femoral and profunda femoral veins are obstructed, they do not provide specific information on the overall inflow these systems provide into the iliac outflow tract. Validated measures of inflow and overall hemodynamics are available in the arterial system, which allow precise comparisons to be made between various treatment strategies. These measures are needed for the venous system to facilitate a better characterization of the severity of disease and improvement resulting from interventions. The treatment of deep venous obstruction is currently experiencing phenomenal growth as physicians discover the capability that intervention offers to improve patient symptoms and heal recalcitrant wounds. However, this growing field has yet to define successfully those patients who can benefit the most from these procedures. It appears clear that a multinational consensus of venous specialists is needed to create and validate a classification system to facilitate patient counseling, device development, and the selection of the most appropriate treatment strategies for specific types of disease. As information from ongoing clinical trials in venous stenting becomes available, the generated data may be useful in further defining and validating this type of system. Further use in a prospective manner would be required to determine its relevance to clinical practice. A final, and potentially the most important, possibility is the ability to relate the extent of disease to symptom improvement after an iliocaval venous obstruction intervention. In many areas of vascular disease management, such as carotid disease or lower extremity peripheral arterial disease, the severity of the disease has been related to the benefit of the intervention. Patients with less severe disease are less often offered an intervention due to a relative lack of benefit from an intervention in these categories of disease. A classification system for venous disease that relates to the type of anatomic disease to symptom improvement after an intervention may provide meaningful information on the improvement in the quality of life that can be expected after a venous intervention. As utilization of venous interventions in this area increases, it is critical that we develop precise information to determine the necessity and guide for the optimal performance of these interventions. 1. Marston WA, Carlin RE, Passman MA, Farber MA, Keagy BA. Healing rates and cost efficacy of outpatient compression treatment for leg ulcers associated with venous insufficiency. J Vasc Surg. 1999;30(3):491-498. 2. Neglén P, Hollis KC, Olivier J, Raju S. Stenting of the venous outflow in chronic venous disease: long-term stent-related outcome, clinical, and hemodynamic result. J Vasc Surg. 2007;46(5):979-990. 3. Hartung O, Otero A, Boufi M, et al. Midterm results of endovascular treatment for symptomatic chronic nonmalignant iliocaval venous occlusive disease. J Vasc Surg. 2005;42(6):1138-1144. 4. Delis KT, Bjarnason H, Wennberg PW, Rooke TW, Gloviczki P. Successful iliac vein and inferior vena cava stenting ameliorates venous claudication and improves venous outflow, calf muscle pump function, and clinical status in post-thrombotic syndrome. Ann Surg. 2007;245(1):130-139. 5. Marston W, Fish D, Unger J, Keagy B. Incidence of and risk factors for iliocaval venous obstruction in patients with active or healed venous leg ulcers. J Vasc Surg. 2011;53(5):1303-1308. 6. May R, Thurner J. The cause of the predominantly sinistral occurrence of thrombosis of the pelvic veins. Angiology. 1957;8(5):419-427. 7. Molloy S, Jacob S, Buckenham T, Khaw KT, Taylor RS. 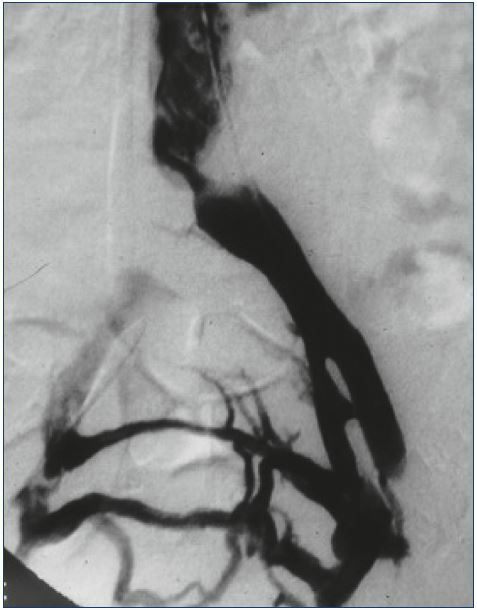 Arterial compression of the right common iliac vein: an unusual anatomic variant. Cardiovasc Surg. 2002;10(3):291-292. 8. Rosengarten AM, Wong J, Gibbons S. Endometriosis causing cyclic compression of the right external iliac vein with cyclic edema of the right leg and thigh. J Obstet Gynaecol Can. 2002;24(1):33- 35. 9. Kibbe MR, Ujiki M, Goodwin AL, Eskandari M, Yao J, Matsamura J. Iliac vein compression in an asymptomatic patient population. J Vasc Surg. 2004;39(5):937-943. 10. Kurstjens RL, Caterinella FS, Lam YL, de Wolf MA, Toonder IM, Wittens CH. The inability of venous occlusion air plethysmography to identify patients who will benefit from stenting of deep venous obstruction. Phlebology. 2017 Jan 1. Epub ahead of print. 11. Kurstjens R, de Wolf M, Kleijnen J, de Graaf R, Wittens C. The predictive value of haemodynamic parameters for outcome of deep venous reconstructions in patients with chronic deep vein obstruction – a systematic review. Phlebology. 2017;32(8):532-542. 12. Gagne PJ, Gasparis A, Black S, et al. Analysis of threshold stenosis by multiplanar venogram and intravascular ultrasound for predicting clinical improvement after iliofemoral vein stenting in the VIDIO trial. J Vasc Surg Venous Lymphat Disord. 2018;6(1):48-56. 13. Titus JM, Moise MA, Bena J, Lyden SP, Clair DG. Iliofemoral stenting for venous occlusive disease. J Vasc Surg. 2011;53(3):706-712. 14. Dormandy JA, Rutherford RB. Management of peripheral arterial disease (PAD). TransAtlantic InterSociety Consensus (TASC). J Vasc Surg. 2000;31(1 Pt 2):S1-S296. 15. Raju S, McAllister S, Neglen P. Recanalization of totally occluded iliac and adjacent venous segments. J Vasc Surg. 2002;36(5):903-911. 16. Crowner J, Marston W, Almeida J, McLafferty R, Passman M. Classification of anatomic involvement of the iliocaval venous outflow tract and its relationship to outcomes after iliocaval venous stenting. J Vasc Surg Venous Lymphat Disord. 2014;2(3):241-245. 17. van Vuuren TMAJ, de Wolf MAF, Arnoldussen CWKP, et al. Reconstruction of the femoro-ilio-caval outflow by percutaneous and hybrid interventions in symptomatic deep venous obstruction. Eur J Vasc Endovasc Surg. 2017;54(4):495-503.